Solar Cell Driven Wall Fan/Extractor is powered by sunlights, ambient lights, no noise and pollution free. It will prevent condensation, mildew, musty odor, damp etc. at area being ventilated. They are great for summertime use but are also very useful during the winter as they help extract damp air and minimize damp conditions. 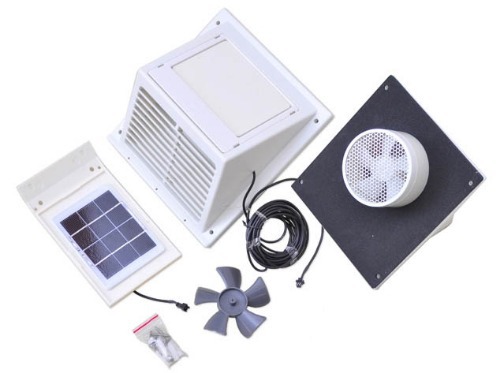 This solar ventilator is constructed within a weather and water resistant ABS plastic housing for protection which measures approx. 210mm x 240mm, holes are provided in all four corners for easy attachment to your wall, the vent duct on the rear protrudes by approx. 57mm and is approx. 110mm wide so the hole cut-out size in your wall needs to be approx. 110mm wide for the rear vent duct to fit into it. Att: you may need extra extend tude to install in on a brick wall. you are buying EG-SF102 without Battery and switch,only work on sunlight, it comes with a separated solar panel instead of integrated one. Water resistant, no-noise, safe and pollution free. comes with a separated solar panel(with 425cm wire) instead of integrated panel. Easy installation. 11cm diameter cut-out. overall size:24x21x13cm, duct dia is 11cm, 6cm deep. Telephones Boxes, Temporary Site Accommodations, etc.